My family has always loved Bush’s Baked Beans. While wasting time searching Pinterest diligently for healthy meals to feed this hungry brood, I found this recipe! Several people have posted it, they are all the same basic recipe, so I can’t credit the original recipe to one person. But, whoever she is, I love her! I can’t say these taste like Bush’s per se, but they are very good, and I am more than happy to be able to serve my family something that I know has no added ingredients, preservatives, or GMO’s, and I can pronounce everything in them. 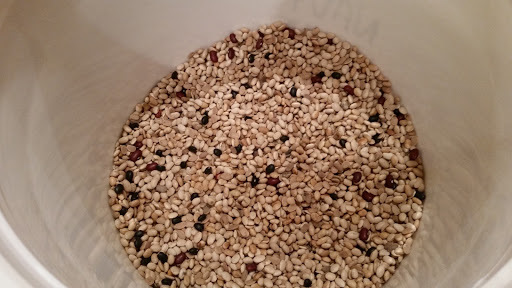 Want to see my bucket of beans? 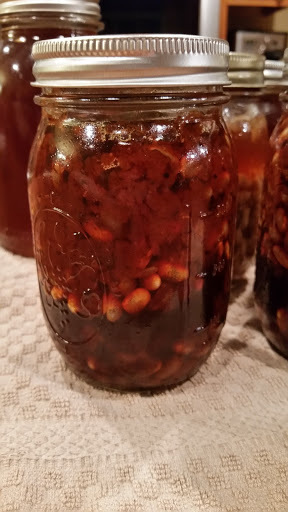 Prepare 4 pint jars according to standard accepted practices… you know, wash in warm soapy water, and sterilize in boiling water until ready to use. Place 1/2 cup dried beans and 1 tablespoon diced onion into each jar. Wipe the rims, place 2 piece lids on the jars, and process in a pressure canner at the recommended pressure for your elevation for 1 hour and 15 minutes. FOLLOW THE MANUFACTURER’S DIRECTIONS FOR OPERATION OF YOUR PRESSURE CANNER. * The original recipe called for brown sugar but I substituted an equal amount of organic sucanant. ** The original recipe called for molasses but I didn’t have any, so I substituted sorghum instead. I really like the tang it added. This sauce is very good but sweet. For the next batch I will probably omit the sucanant all together. I just don’t think it’s needed.